When you live in a big city, you get used to its loud sounds and go about your life in the comfort of your own home. The sirens, the alarms, the honking and the sounds of seemingly endless construction may still be annoying, but all city dwellers get used to these sounds – even gunshots. But, what about blood-curdling screams from outside your door late at night? Do you run out and check or look out your window to see if anyone needs help? Or do you just dial 911? Could your action save someone’s life or is it best to stay out of it? These questions and more are posited in “The Witness”, a documentary directed by James D. Solomon that goes over the details of one of the most famous murders in New York City and the lives that were affected when no one responded to a cry for help. 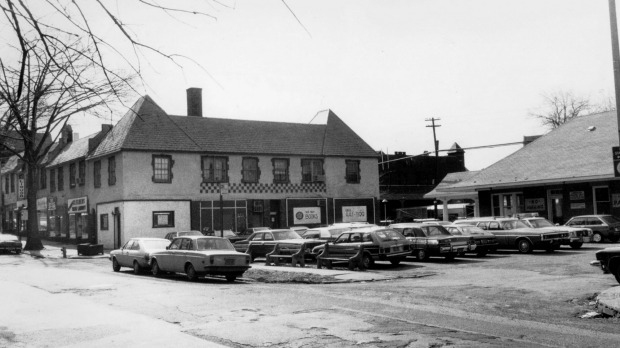 At 3am on the night of March 13, 1964, Kitty Genovese, a 28 year-old second-generation Italian woman was brutally murdered when she was stabbed by Winston Moseley near her Kew Gardens apartment in Queens. The random attack and her shrill cries for help were heard and supposedly seen by residents who resided in the nearby Mowbray apartment building. Yet no one came to her aid – or at least that’s what was reported. Due to the public’s lack of assistance, the murder made the news – repeatedly, for decades – and has been studied in sociology courses to this day as an example of social or bystander apathy. In an era long before the “see something/do something” awareness plea, it is assumed that anyone who watched or heard transpired outside their homes were afraid to get involved. Kitty’s murder supposedly led to the development of the 911 emergency line (operators were still used back then), the “Good Samaritan Law” and Neighborhood Watch Groups like the Guardian Angels. It also spawned countless studies on bystander inaction (“Kitty Genovese syndrome”) and inspired songs, books, dramas, an opera and a graphic novel. Recently, both HBO’s “Girls” and NBC’s “Law & Order: Special Victims Unit” based episodes on the infamous crime. Kitty’s name is often used to describe those who are visibly in need (like Trayvon Martin and Syrian refugees), yet receive no assistance. “The Witness” follows one of Kitty’s siblings in 2015, William “Bill” Genovese, as he seeks the truth of that fateful night. 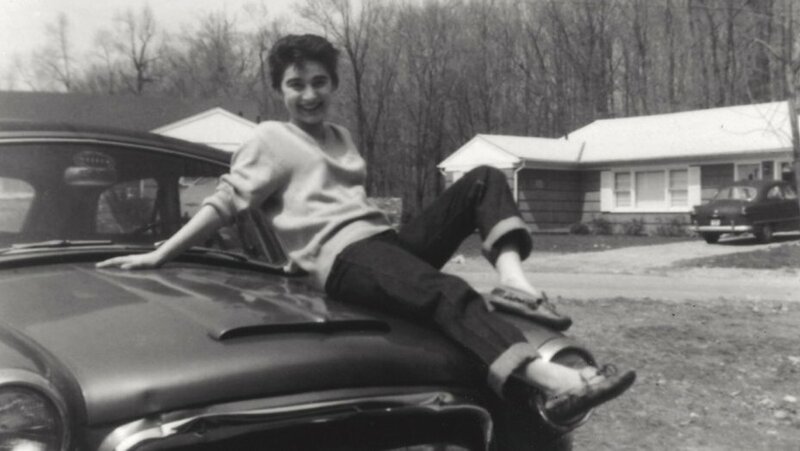 Bill had been very close to his big sister and was 16-years-old when Catherine Susan “Kitty” Genovese was killed. Her death changed his life forever when he enlisted in the marines and went off to serve in the Vietnam War at age 19, determined not to remain inactive like those witnesses were – unfortunately, his legs were blown off by a landmine while patrolling a village. Yet through all his life events – getting married to a woman and having children that Kitty would never meet – his thoughts remained on that night when his sister died. Like many people who’ve had a loved one murdered, there is a gaping wound left and an assortment of unanswered questions and thoughts swirling in the minds of those who survive the victim. The cathartic search for clarity is what propelled Bill to pursue details and answers to Kitty’s death. The more he learns about the reporting of the murder by the police and the press, the more he learns about his sister’s life at the time and about her killer. 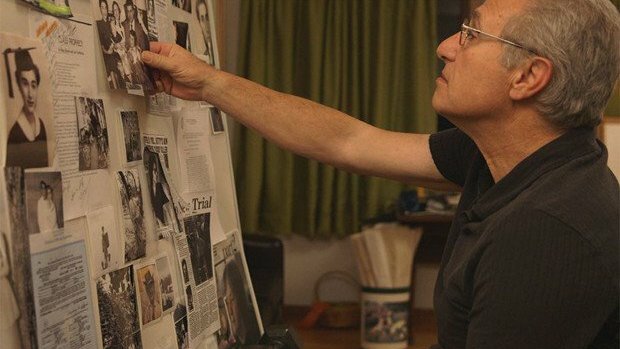 Solomon (screenwriter of Robert Redford’s “The Conspirator”) spent eleven years making this documentary, which captures Bill’s quest and also shines a light on grief, loss, forgiveness and how easily we believe the details of a news report once it is circulated and repeated over and over again. Weeks after the initial report, Martin Gansberg reported in the New York Times that their were 37 eyewitnesses (it turns out most of them were merely “earwitnesses” and it has been variously quoted and reproduced since 1964 with a headline that begins “Thirty-Eight Who Saw…”) to her struggle with Moseley that lasted approximately 30 minutes – some of them simply went back to sleep. 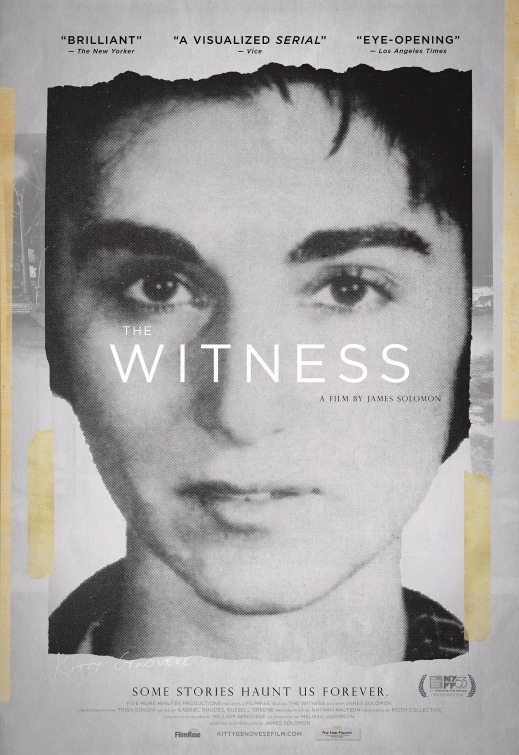 “The Witness” looks into what these witnesses saw or heard, as Bill scours through police reports and trial transcripts and tracks down surviving witnesses, searching for something that feels unfinished. In the process, Bill discovers aspects of Kitty’s life that he knew either nothing or very little about, while his siblings look on and wish that their brother would just drop it. He learns that Kitty was working as a bar manager in Hollis at the time and a neighbor friend of hers, Sophia, actually came to her side as she died on the floor of a hallway in the apartment building they lived. It’s easy to feel for Bill and his family as we learn along with him and it also makes us wonder what we would do if we heard such a thing outside our own window. Some of the interviews conducted by a very patient and humane Bill are far more revealing and frustrating than others. He has conversations with New York Time editor, A. M. Rosenthal, who published a book in 1964 Thirty-Eight Witnesses: The Kitty Genovese Case which explored the case as well as CBS newsman Mike Wallace, asking both of them about “the 38”. When Bill asks Wallace if it was all media creation, he replies, “Oh, I think to a certain degree it was a media creation. No one investigated the 38. No one followed up on it or anything of that nature.” He follows that by answering Bill’s “why” follow-up question with, “Because it was taken seriously by The New York Times.” This kind of truth is hard to hear, but unsurprising seeing how news is often spun for ratings. 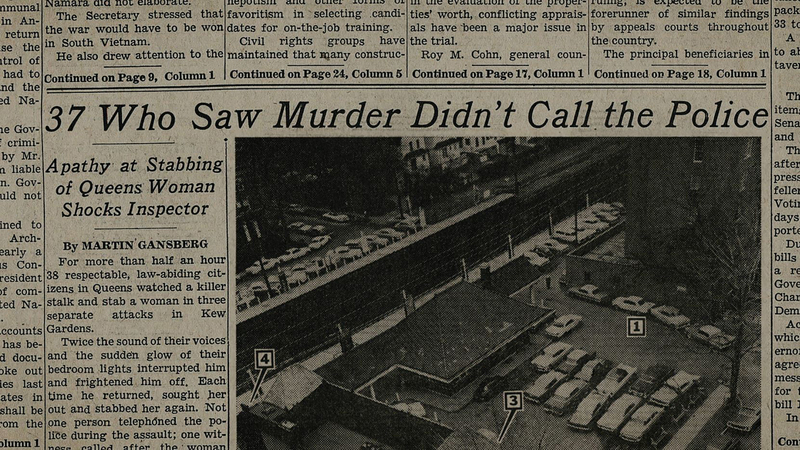 In 2004, on the 40th anniversary of Kitty’s murder, an article was written byJim Rasenberger in the New York Times that investigated the claims of the original article. It raised numerous questions about the events as the public came to know them and in 2007, a study found many of the purported facts about the murder to be unfounded. So, where does that leave Bill Genovese and his family? Anywhere closer to learning the truth about their sister’s death? This leads to one of the more challenging moments of Solomon’s film, when we watch as Bill pursues the idea of speaking with Kitty’s incarcerated killer face to face. His goals: to find out Moseley recalls from that night and if he was aware what he did. It was already established earlier in the film that Moseley admits to “going out and looking for a woman to kill” and that he had done just that during the week leading up to this night. Moseley declines to speak with Bill (probably for the better) and instead Bill talks with his son, Steven Moseley, who has lived his life under the shadow of a killer father and has since become a preacher to course-correct his family line. It’s a revealing and somewhat healing look at two men who were drastically affected by one horrific act – not so much an atonement, but the start of a healing for them both. The last twenty minutes of “The Witness” confirms just who the titular observer is. It’s probably the most gripping and gut-wrenching sequence of catharsis and healing I’ve seen in some time. It’s more impacting if I don’t describe any of it and while I’m not sure it really works with the rest of the film, it nevertheless feels quite needed. Whether you know the Genovese name for the murder of Kitty or are just learning about it now, “The Witness” provides an open and vulnerable look at a man searching his past to help him with his present and future.